Posted on Nov 01, 2009 by Jeff Tecklenburg. Announced at the beginning of 2003 and receiving the go-ahead from the people of Panama, the Panama Canal expansion project has reached the stage where design and construction of its new locks has begun. Expanding the Panama Canal is generally seen as good, as more and bigger ships will be able to benefit from that shipping shortcut. Although the project kicked off before the global market crash, and shipping is not growing at the pace that precipitated its launching, there is merit in continuing the project. The canal is a key piece of world infrastructure, overdue for enhancement, regardless of momentary market conditions. Proven by experience, investing in infrastructure during down markets is a wise move. Building then typically reduces project costs — supplies usually costing less — plus it generates jobs in an otherwise depressed environment. Such investments often pay off sooner, as markets revive, which strengthens recovery. This, of course, assumes that the investment is well planned. 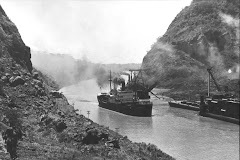 Problem is, the present Panama Canal expansion is not. The project’s most critical step — identifying the lock system that best fits the conditions and characteristics of the canal — was skipped. Per the current plan, the canal gains one new lane having a three-step lock unit at each end, with three water-saving tanks per step (18 in total). Of greatest concern is the building of a risky dam — across known geologic faults — to link the new Pacific locks directly to higher elevation Gatun Lake, skirting Miraflores Lake. Its failure would empty Gatun Lake, wiping out homes and businesses lining the canal’s Pacific approach. That would close the canal for years, deeply affecting U.S. interests. Another concern is with excessive volumes of salt intruding through the new locks, altering Gatun Lake’s freshwater ecosystems and gravely threatening coastal sea life of both oceans, turning it into a migratory pathway across the Isthmus of Panama. Yet, our independent research identified existing lock arrangements that avoid these risks and increase efficiency by combining the same components and operations differently. For instance, a two-lane lock arrangement of comparable cost — requiring only two steps at each end of the canal — uses about 13 percent less water per transit and assures effectively uninterrupted large-ship transits. Like the Pacific lock arrangement of today’s canal, each end’s two steps would be separated by a short stretch of channel, canceling the risky dam and virtually eliminating the threat of salt reaching Gatun Lake. This two-lane arrangement preserves conditions of Gatun Lake, and of both oceans, and the livelihoods of those dependent on those waters. With the current plan’s water availability already “iffy”, the unpublicized plan — to build yet another lane like it — will require annexing and flooding neighboring areas, displacing a lot more people and wildlife. The two-lane arrangement can reduce its per transit water use significantly (to 57 percent of the current plan) by adding two water-saving tanks to its lock units. That permits maximizing its transit capacity with water available today. The need for development to be sustainable gets a lot of lip service these days. Yet, this major canal’s expansion proceeds unquestioned. Improving return on investment by maximizing efficiency, service and reliability, while minimizing impacts to others and to the environment, appears irrelevant to a business model reminiscent of those that collapsed world markets. With attainable short-term profits already guaranteed, no incentive for improvement exists. That incentive must be created with political pressure — soon — else suffer unnecessary permanent environmental damage, reducing the Panama Canal’s potential forever. Bert G. Shelton is Texas-based research scientist and engineer with a lifelong interest and study in the Panama Canal’s function and structure.